I've refrained from posting a straight exegesis essay for as long as I've been on the CiC team. The blogosphere isn't usually the place for that kind of stuff. Well, not unless you have a Ph.D. and write a weekly article on Greek words, like Bill Mounce does at Koinonia. I love "Mondays with Mounce" on that blog- at this point it is the main reason I subscribe. Dr. Mounce models scholarship for the sake of the church as well as anyone I know of. "Mondays with Mounce" always moves from exegesis and Greek words to application in genuinely helpful ways. Today's post was on John 15:2, in response to a question that a reader submitted to him. The basic issue is this: if the semantic range (that is, the range of possible definitions) of the Greek word airo allows for either "to take away" or "to lift up", then why does every translation of Jn. 15:2 elect for the former? Mounce says that "to lift up" basically makes little sense (after all, what does it mean to "lift up" an unfruitful branch? ), and we should stick with "take away," especially because Jn. 15:6 parallels that reading. This decision agrees with every translation that I am aware of and every commentary that I've read on the passage. Which puts me in the serious minority since I disagree. Incidentally this is the single passage of the Bible I've spent the most time thinking about over the last five or so years in my academic theological training. I've considered writing on it for awhile, but haven't wanted to do a simple exegesis post. Well the precedent is now set for me to do so, so here is my response to Dr. Mounce, complete with section markers, since this post got long fast. First, let's consider the semantic range of airo. There is precedent in John's Gospel for both "take away" and "lift up". If I remember correctly, John uses airo to mean "to take away" twelve times and "to lift up" seven (it is close to that if that is not exact!). Other instances are disputed. This indicates that John's parlance reasonably allows for either translation. Second, the closer context. The main point of Jn. 15:1-6 is stated in v.1: in one of the six classic "I am" statements in John, Jesus says that he is the "true vine" and that his Father is the vinedresser. The rest of this post will work through Jn. 15:1-6, and since it got pretty long, I have provided section headings for my arguments. "Vine" imagery is common in the OT, where often the text speaks of Israel as a vine that God planted. Most notably here are Ps. 80:8ff; Isa. 5:1-7; and Jer. 2:21. Each of those passages has Israel as a vine that fails to produce fruit. The psalmist suggests that God has broken down the vine, but Isaiah and Jeremiah say that the unfruitfulness is the vine's fault, despite that God has given the vine all of the proper care it needs to bear fruit. This sheds important light on Jesus' use of vine imagery. We should roundly reject the idea that Jesus was passing by some vines while talking to his disciples and suddenly thought, "Gee, that'd make a good analogy." Rather, Jesus knew his Bible well and purposely contrasted Israel's unfruitfulness with his own sufficiency for fruit-bearing as the life-giving vine tended by the perfect vinedresser. Jesus could do what Israel failed to do: give life to all who come to him. Not only is this the maint point of the present passage, but Jesus' sufficiency vis-a-vis Israel's failure is in fact a common theme in the Fourth Gospel. Understanding 15:2: The Significance of "in Me" (Gk. en emoi). But this immediately appears troubling when we get to v. 2. If Jesus is so perfectly life-giving, how come there are fruitless branches being taken away? This is especially troubling since the branch described in v. 2a is said by Jesus to be "in Me" (Gk. en emoi). Does this teach that Christians can lose their salvation if they don't bear fruit. Calvinist commentators have to do something about this. Carson, for example, simply says that we shouldn't press the "in Me" statement to mean that the person is a Christian. To which I say, "Why not?" Of course that's what we should do, because the text plainly says that there is a branch that is really connected to the life-giving, perfect vine, Jesus. There is simply no getting around that fact! The better answer is to keep reading. Verse 2b gives us a good hint. The Greek word translated "prune" here is kathairo. Even if you don't know Greek, just look at and pronounce the transliterations of the words as best you can: airo and kathairo. Jesus (or John in his translation) is employing some wordplay, paralleling the actions that the Father is taking towards the unfruitful and fruitful branches. Even in English it is obvious that the rest of the two phrases parallel each other. V. 2 ends with the statement that the fruitful, pruned branch will "bear more fruit". While I am not sure that this final statement is grammatically connected to both statements, the idea seems to be the same: since the emphasis of the passage in v. 1 is on the ability of Jesus and the Father to provide life in a way that will make the vine bear fruit, as long as a disciple of Jesus is "in the vine" so to speak, he will bear fruit. 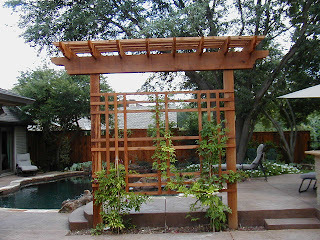 You might be saying to yourself "Sure Andrew: we use trellises now to grow vines, but did first-century Palestinians?" Enter Gary W. Derickson. In a 1996 article published in BibSac, Derickson argues that while vines usually grew along the ground, if they did not bear fruit during the pruning season, they would be lifted up onto a trellis so that they might begin to. In fact, not only did first-century Palestinians trellis unfruitful vines, but they did not cut them off during pruning season (and we assume Jesus is talking about pruning season because of the pruning parallel in v. 2). Vines would have been common enough in first-century Palestine that this would be obvious to most folks, even if they weren't vinedressers themselves. What makes this an especially interesting proposal is that, as the first footnote of his article indicates, Derickson has a B.S. and M.S. in horticulture from Texas A&M and has even taught grape-pruning! This provides a pretty remarkable perspective on Biblical backgrounds for a guy with a Th.M. and Ph.D. from Dallas as well. I have checked most John commentaries written after 1996 but have never seen anyone respond to Derickson's article even though they do not accept his thesis. In his massive two-volume John commentary, even the NT background guru Craig Keener notes the article but does not interact with it at all. This is disappointing. If we accept Derickson's proposal, the passage reads like this: Jesus is the true, life-giving vine and his Father is vinedresser. As long as a branch remains in the vine it will bear fruit. If it is not doing so immediately, it will be lifted up onto a trellis so that hopefully it will begin to bear fruit. If it is already bearing fruit, the Father will prune it so that it will bear more fruit. V. 3 indicates that the eleven disciples (Judas is gone by now) are already "clean" (another play on words, since "clean" is the noun form of the verb kathairo) because of the word Jesus spoke to them (referring to Jn. 13, where "cleanliness" comes up in the foot-washing). That is, the disciples are in the vine, bearing fruit, and already have been pruned in some sense. They are ready to bear more fruit. The facts that Jesus is the life-giving vine and the Father is the perfect vinedresser are the reasons why the branches' job is simply to remain/abide in Jesus, the true vine. As long as that happens, they will bear fruit sooner or later. Thus vv. 4-5. The branch in v. 6 is never said to be in the vine. This may seem unimportant, but note that "in me" has already come up three times in this passage. Contra Carson, it is actually quite an important part of Jesus' discourse. Derickson says that during the pruning season, the reason unfruitful branches are not cut off is because they are totally useless little sprigs. But in the later season if they are still fruitless, the branches have grown more and become more "woody" which means that at least they can now be cut off and used for firewood. Note the change in pronouns. Vv. 3-5 and 7ff has Jesus referring to "you" plural (i.e. the eleven disciples). But v. 6 refers to "anyone." Why the shift? Well, for one thing, the audience is the eleven disciples. John knows full well when he records this story that none of them will in fact fall away. More importantly, the "If anyone..." (or "whoever" in some translations) phrase (more specifically in Greek, ei + tis + a verb in the subjunctive) is a literary device John uses throughout the Gospel when Jesus states a universal truth that applies directly to all people, including his readers who were not there at the time Jesus spoke the words. So in Jn. 3:3, where the same conditional construction is used to present a negative statement, Jesus is telling everyone, not just Nicodemus, that one must be born again to see the Kingdom. In Jn. 7:37-38, Jesus tells his listeners at the Feast of Tabernacles, "If anyone is thirsty, let him come to me and drink." But that expands the audience to John's readers as well. And as Jn. 20:30-31 indicate, John was consciously concerned about his readers' understanding of and belief in Jesus, and this is actually a common construction throughout John. So 15:6 does the same thing: the reader should know that despite that the disciples are clean (v. 3), they must go to the vine themselves or else their fate is to be cast into the fire (whether or not that means hell is a different question!). Application, Bill Mounce Style (or Using Mounce's Pastoral Approach Even when you Disagree with Him). I realize that this post has been long and I imagine if you weren't interested in this issue already or in Mounce's discussion, you're not reading this. But since I'm responding to such a pastoral scholar as Mounce, allow me to follow his lead and make a pastoral point: there is nothing more important for us as Christians than to abide in the vine, Jesus. Without him, we can do absolutely nothing of any fruit-bearing significance to Jesus. Do you want to live in a way that pleases God and bears fruit for the Kingdom? Spend as much time as possible fellowshipping with Christ as the true spiritual temple (Jn. 2:1-12-25; 4) eating of him as spiritual food (Jn. 6), drinking of him as spiritually-quenching drink (Jn. 7), and getting spiritual life from him to bear spiritual fruit (Jn. 15). whoops, didn't phrase the last one right...why has no commentary interacted extensively with this article? I honestly have no idea. I remember when Kostenberger's commentary came out I grabbed it and flipped to Jn. 15 right away, just hoping for some interaction. That said, I'm finding more and more people who have the view I have expressed here. I know Andy Stanley preached it that way, so maybe it got disseminated from his sermon more. Anyway, I would understand if someone had written about it, argued against it persuasively, and everyone who followed just pointed to that initial interaction. But I haven't seen any interaction with it really at all. I'm the person that asked the question of Mounce. Thanks for the post. I hadn't heard of Derickson before, I'll have to check him out. Does holding your view of this passage change the application in any way? It seems that Mounce could have, and probably does have (I didn't read it), the same application. Glad to fill you in on the article! I hope it helps. Any thoughts on my take on the passage? And how did you come to your view? Application? Probably not. The point of the text is clear no matter which way you take it: Jesus is the source of life that leads to fruit, so abide in him. The big issue is theology. If you believe in eternal security/perseverance of the saints, what do you do with v. 2 where a branch that is in the vine is being cast out (if you take airo that way). But I think you're probably right that Mounce would go for the same application in general. I suppose the only difference would be that my reading of the text should encourage a believer who doesn't see fruit to simply keep working to abide in Jesus through the Spirit and under the "gardening" of the Father, as it were. As long as we do that, fruit will come. Well, I haven't solidified my view yet, but right now I'm probably on the same page as you. Very good post. You wrote, "The big issue is theology. If you believe in eternal security/perseverance of the saints, what do you do with v. 2 where a branch that is in the vine is being cast out (if you take airo that way)." What does Derickson do with it? I don't remember what Derickson does for sure, but I'm pretty sure that he doesn't have to do anything with it because he doesn't think that the unfruitful branch in v. 2 gets cast out. He thinks it gets lifted up so that it begins to bear fruit. Therefore, there is no theology difficulty! Thank you for your thoughts on this passage. I'm not too familiar with Mounce, but I thought his post took a very unscholarly approach to addressing the question. I've been studying this passage for months to preach on it soon, and the more I study, the more convinced I become that airo = "lift up"... and that the fire has nothing to do with judgement, simply highlighting the uselessness of a branch that does not abide. As for application, there is a huge difference between your conclusion and Mounce. He suggests in his later post that "the primary purpose of the metaphor is “to insist that there are no true Christians without some measure of fruit. Fruitfulness is an infallible mark of true Christianity” (Carson, The Gospel According to John, p. 515)." Actually the primary purpose is to insist that believers must abide in Christ to bear fruit. Contrary to Carson/Mounce, there are believers who choose not to abide and consequently whither (though they remain 'branches'). 1. In the Derickson article, in presenting Dillow's interpretation (the 'fellowship' view), R.K. Harrison is cited as a commentator who takes airo to mean "lift up." I wish Derickson had interacted more with Harrison (or perhaps there is not more than what Dillow cites to interact with). In fact, I wish Derickson had interacted more with Dillow (even though their interpretational conclusions are different, they are both arguing for the same point in v. 2). 3. It is interesting to note that a major crux in Derickson's argument is his reliance on Pliny. I think without the Pliny citation, Derickson's argument becomes less compelling (especially regarding the multiple 'types' of non-fruitbearing branches that were maintained by the vindedresser). Fascinating and corroborating for sure! But a large amount of dependance nonetheless. 4. Finally, and disappointingly, Carson *seems* to discount both Pliny and the whole 'viticulture argument' with his commentary. On page 518 he notes, "…Yet in the context of viticulture it is not the most natural way to take it (i.e. to take it as 'lifts up'). Despite arguments to the contrariety [of which Carson does not cite any! ], there is no good evidence of which I am aware to confirm that lower stalks of grapevines were seasonally 'lifted up' from the ground." For me, I held onto the traditional view a) because of how every translation handles v.2, and b) out of immense respect for guys like Carson and Mounce. But having read Derickson, and seen the lack of interaction by Carson/Mounce with his interpretation, I'm think I am convinced. The Derickson interpretation helps bring enormous clarity, not only to a problem verse, but to the whole passage.